The FX Network was set to launch the third season of its spy drama, The Americans. Secret screenings had been set up in select cities in the days leading up to the premiere. The operation was clear; organizers wanted to create a great experience for show fans – an experience that extended far beyond the event. The event planners left their creative fingerprints all over each venue. Branded ice sculptures and strategic lighting set the scene. Fans were served spy-themed appetizers and Russian vodka samples at the event and given branded blankets to take home. Leading up to the main event, a special advanced screening of the season premiere, fans were entertained – phototained to be precise. With covert props, fans got in touch with their double agent side for a picture. By planting strong visual elements, equipping fans with event photos, and creating a unique event hashtag (#TheAmericansSecretScreening), event organizers hinted at social media sharing and fans willingly took the bait! Search the hashtag on Facebook, Twitter and Instagram and see for yourself. High tech gadgets like smart phones and photainment systems made it easy for fans to share event images on social media. Tapping into guest’s social networks, the event experience spread online and increased brand exposure for the FX Network and The Americans exponentially. There’s no need for extra intel to crack that code. 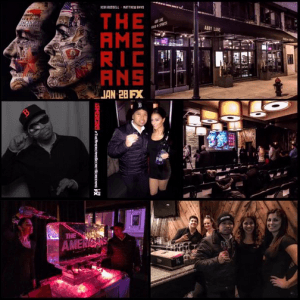 TapSnap was the proud partner in crime at The Americans screenings in Dallas and Miami. Take a look at our favorite photos from the event.